The NCAA Men's Division I Basketball Championship is a single elimination tournament held each spring featuring 65 college basketball teams in the United States. 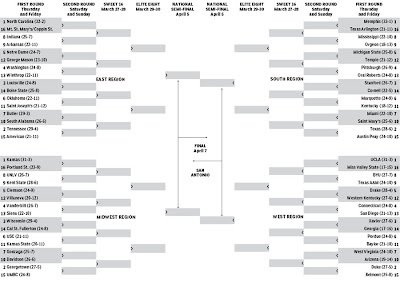 Colloquially known as March Madness (as the tournament takes place mainly during the month of March) or the Big Dance (as opposed to the now smaller and less prestigious NIT), the tournament takes place over 3 weeks at sites across the United States, and the national semifinals (the Final Four) have become one of the nation's most prominent sporting events. The selection committee has seen all the tape and made its choices. North Carolina (32-2), Memphis (33-1), Kansas (31-3) and UCLA (31-3) captured the NCAA March Madness No. 1 seeds on Sunday. Those teams will share the bill with 60 others, and all of them will fight for the NCAA championship, which will be decided when the tournament finishes on April 7 in San Antonio.